Safari Magic. Travel Tips - Kenya. Kenya straddles the Equator, bordering the east coast of the African continent with Lake Victoria on its southeast. It's almost 225 thousand square miles in area makes it roughly the size of Texas and, almost 10% of that total is dedicated to wildlife conservation. Although perched on the Equator Mount Kenya’s summit is snow and ice covered and at 17,058 feet is the country highest. The longest river, the Tana, flows 376 miles from there eastwards to the Indian Ocean. The Great Rift Valley cuts a swath north – south and its spectacularly dramatic scenery is unsurpassed in Africa. The north and east of Kenya are arid and semi-desert acacia bush lands; the south and southwest are mostly higher elevation tree-dotted savanna. In its center, Kenya’s Highlands is a high plateau containing the Aberdare Mountains and Mount Kenya and are home to a very rich agricultural area. Kenya gained independence from Great Britain in 1963 and is a republic. Nairobi, the capital, is home to over 2 million of the country’s over 30 million inhabitants. There are over 40 tribes of which the Kikuyu is the largest, and over 30 spoken languages with Kiswahili and English both official languages. Most of the population are members of Christian churches, with Islam, Hindu and indigenous beliefs holding minority sway. Economically, Kenya has always been one of the more prosperous African nations. Agriculture accounts for 2/3 of its exports with tea, pyrethrum, coffee, vegetables and cut flowers major cash crops. 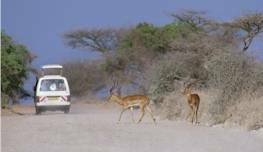 Tourism is a major source of revenue and employment and wildlife its biggest tourist draw. Kenya introduced, pioneered and perfected the concept of “safari” and has truly created the desire of so many travelers to participate in this great game-viewing adventure.